According to the National Highway Traffic Safety Administration (NHTSA), about 200 fatalities and 6,000 injuries that occur in auto accidents each year are attributed to tire-related causes. Used tires specifically receive a great portion of the blame. NHTSA warns that used tires can be a safety issue. A used tire may have been driven for too long while under-inflated or may have experienced impact damage due to potholes or curbs, Damage may not be visible on the outside portion of the tire and could be a greater risk of failure during driving. Although one would think that used tires with visible damage would not be installed on vehicles, they still are, and they offer a significant risk to drivers and passengers. Used tires with visual problems are installed because only a handful of states have laws preventing it. As a result, the U.S. Tire Manufacturers Association is lobbying state legislatures to pass laws against the installation of worn out, damaged or improperly repaired used tires that pose a risk to life if they fail during an auto accident. The USTMA does not assert that it is against the use of all used tires. It notes that more than 30 million used tires enter the national market every year and many are safe for use. However, the guidelines in the law will help retailers determine which used tires are safe to use. Consumers are cautioned to carefully inspect used tires that they intend to buy for damage and ask the salesperson to prove that they are safe. During National Tire Safety Week, consumers will be educated on the importance of properly maintaining their tires. NHTSA offers information on how to maintain tires at their website. The tireWise page covers such issues as buying tires, maintaining them, and how age can affect their safety. Proper tire maintenance is not only essential to safe driving. It also can help you save money. For example, underinflated tires reduce a vehicle’s fuel economy and increase the amount of greenhouse gases and other pollutants caused by fossil-fuel-burning vehicles into the atmosphere. You may not be aware that proper maintenance of your tires can save you as much as 9 cents per gallon on the purchase of gasoline. Moreover, tires will last longer. It is said, for example, that proper tire inflation can extend the life of a tire by as much as 4,700 miles. 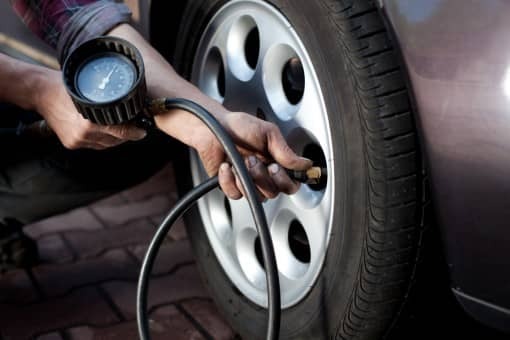 Tire maintenance is especially important when it concerns 15-passenger vans. Improper inflation can cause loss of control of this type of vehicle and possibly a rollover. In addition, according to NHTSA, 15-passenger vans have a rollover risk that increases when the number of occupants in the vehicle increases from fewer than five to more than 10. Therefore, it is essential that you examine your tires and check tire pressure before each drive. Also involved in National Tire Safety Week are the National Automobile Dealers Association (NADA) and the Rubber Manufacturers Association (RMA). RMA is offering information on its website including a free “Be Tire Smart – Play Your Part” kit that includes 200 consumer brochures and posters to educate consumers about proper tire care. •	Choose your tires carefully. It is suggested that you select tires based on their proper size recommendation for your vehicle and its load. It is also recommended that you seek advice from tire or automobile dealers about selecting the proper tires. •	Buy a tire gauge and keep it in your car. The gauge will inform you whether or not your tires are at their proper pressure. Gauges are available at automotive retail stores and supply stores. •	Check your tire pressure at least once a month and before long trips. It is essential that you check your tire pressure to determine if it is under or over inflated. If either is the case, check for a sticker on the driver’s side door for proper tire pressure and adjust your tire’s pressure accordingly. Check pressure when the tires are cold. •	Slow down in wet weather. Driving at a slower rate of speed in the rain assures that the treads of the tire properly contact the surface of the road and will prevent hydroplaning. •	Rotate your tires every 6,000 miles. This assures even wear between the four tires. Have a service professional check for and correct misalignment, imbalance or other mechanical problems before rotation is performed. •	Check your vehicle alignment periodically. This should be done especially if you as the driver feel the vehicle pulling to one side or the other when driving. •	Inspect and measure tire tread. To perform this examination take a penny and place it in the tread grooves. If you can see the top of Lincoln’s head, then it is time to replace your tires. •	Inspect the tire sidewalls. Look for gouges, cuts, bulges or other irregularities. If anything is found, replace the tire. •	Don’t overload your vehicle. This can create excessive heat inside the tires and can cause damage or tire failure. Make sure that your vehicle’s load matches manufacturer’s recommendations. This information can be found on a placard inside the driver’s side doorpost or in the owners’ manual. •	Be aware of objects on the road that could damage your tires. •	Check the valve cap of the tire. Valve caps protect the valves and should be checked for any damage due to rocks or debris. •	If you use your vehicle to tow, then be sure that the trailer does not overload the vehicle and that the car is within the maximum weight the tire can handle. •	Check with NHTSA on tire recalls. You can also file complaints about tires with the agency. If you are involved in an auto accident, please contact us. Our staff of attorneys is knowledgeable in guiding you through a lawsuit related to a crash and can evaluate your case free of charge. Any blog content posted on The Eichholz Law Firm website is provided for educational and informational purposes only and is not considered to be legal advice. If you or a loved one believe you have a car accidents claim, please contact us for a free case evaluation.